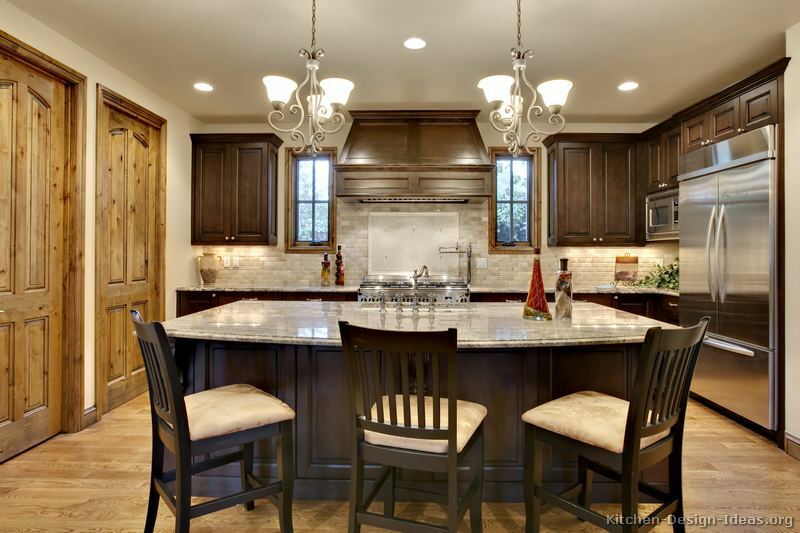 Chocolate Dream: This lovely gourmet kitchen features chocolate brown cabinets, professional appliances, a wood hood, iron chandeliers, and a large breakfast island with stools. The travertine backsplash blends well with the light wood flooring and granite (Crema Bordeaux or similar). Other notable features include a walk-in pantry, a pot filler faucet over the range, narrow windows in symmetry around the hood, and a main sink located on the island. More Pictures: Click here for more photos. This kitchen is #64 (on page 3) of the traditional Walnut-stained kitchens gallery. You may also enjoy the collection of Gourmet Kitchen Designs. Updates: To get Kitchen of the Day updates, visit our Facebook page and click "Like" to connect with us. You should also follow us on Twitter here.